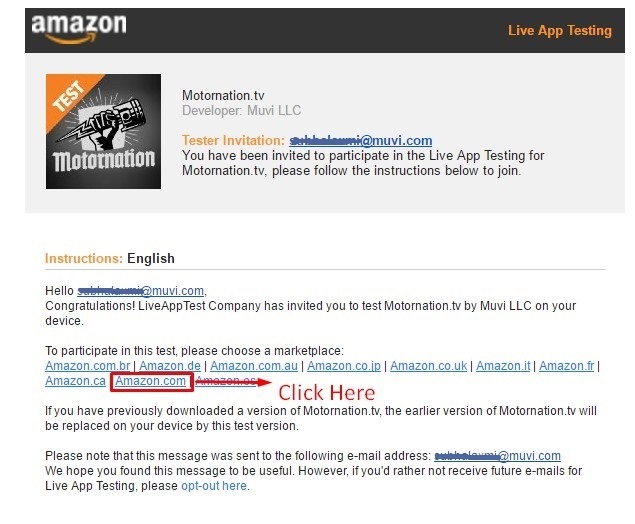 After we develop the Amazon FireTV App for you, there is a way to test the App before we publish it publicly in the app store. It’s called Live App Testing. This is like downloading and installing the App from the real App store. This way, you can confirm that your app is working as likely. You will not be charged for downloading your test app, and will not be charged for in-app items. Your FireTV device is linked to your Amazon account. If you purchased the device from Amazon.com using your ID, then device is then automatically linked. We will send you an email notification to test the App. In this Email, you will see a section “To participate in this test, please choose a marketplace”. Click on “Amazon.com” from the list. (See Below Screenshot). Then login to your Amazon account to visit the App Store. In the Amazon App store, click on “Deliver” to install the App on your device. (See Below Screenshot). Please uninstall the previous version before installing the new one. Getting a new version doesn’t auto update the app unless you uninstall the previous version. Note: When we will make any update to the Amazon FireTV App in the virtual App store, you will get notified about it.